Email preference centers are a secret weapon for email marketers. Just when you think you may have lost your subscriber’s interest forever, you have a chance to put them back in the driver’s seat…and back in your good graces. Every white hat sender should implement a preference center for their email program. When a new subscriber signs up for your list, ask them then and there how much they want to hear from you and about what content. Asking this up front establishes a trust between sender and recipient. It’s the perfect way to start off an email relationship. But what if a user doesn’t set their preferences and you start to see their engagement decline? 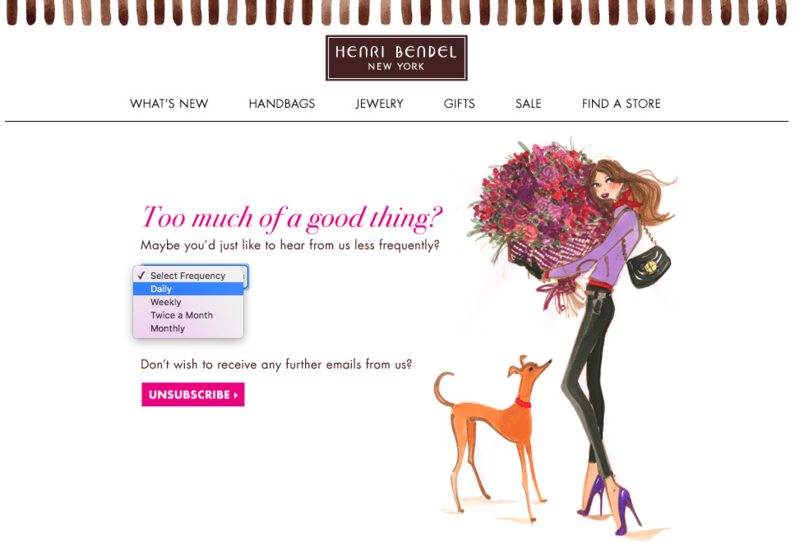 Consider sending an email like this stellar one from Henri Bendel. Henri Bendel realized that I wasn’t engaging with my emails as much as I had previously, so they sent me this upbeat email that basically says “Hey, we get it, you’re busy. Let’s get our sending frequency on a schedule that works best of you.” Love it. They’re speaking my language and they anticipated the exact communication I wanted to hear from them. The emotional appeal is great and the CTA is direct and effective. I also like that they offer up a secondary CTA—if I decide to limit the amount of emails I receive from them, I still have the option of interacting with their brand via social. 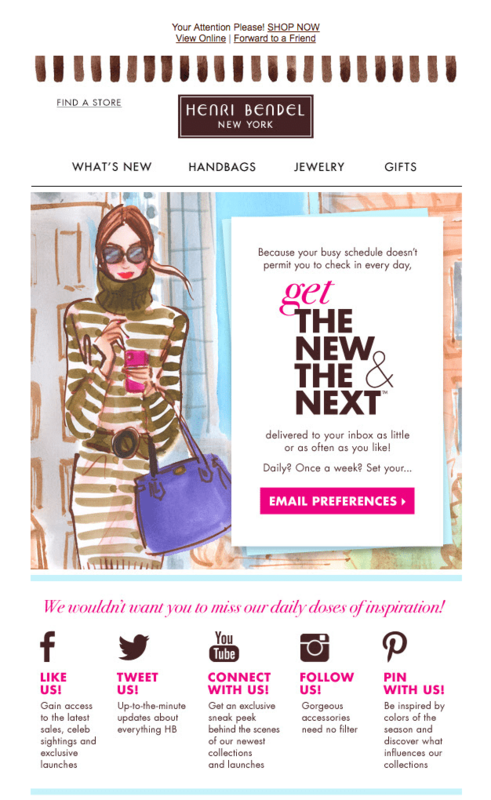 I love it when brands put me in control of my inbox, and Henri Bendel did just that with this re-engagement email. They don’t want to lose me as a subscriber, so they smartly got in touch to ask me to set my preferences. And not only do they ask me to determine how frequently I want to be emailed, but they also give me the option to unsubscribe altogether. Remember having a non-engager on your email list is worse than not having them on your list at all. Quality over quantity! Start off on the right foot: Allow your recipients to set their email preferences with you at the point of sign up. Closely monitor your engagement metrics: If you see a decrease in engagement from your subscribers, ask them to set their preferences. Keep your ask short: If you’re already seeing decreasing engagement from your subscriber, recognize that their time is valuable and get to the point quickly. Make unsubscribing an option: If your subscriber continues to not engage with your emails, unsubscribe them. Their non-action is telling you all you need to know. 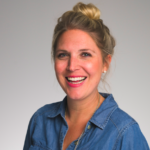 For more tips on how to keep and grow an engaged subscriber list, check out our guide: How to Authentically Grow Your Email List.